This AA Cream foundation aims to give an “automatic aura” after application while preventing acne and aging. It applies smoothly and a tiny bit goes a long way. I honestly feel like this pouch could last through 12 uses as a couple of mongo-sized drops is more than enough for my face and neck. Warning for those with sensitive noses: the foundation smells heavily of tea tree oil, which is its anti-acne ingredient. I got the shade #23 Natural Beige which is my usual Korean foundation shade but it’s much lighter than the other #23 bases I’ve tried and has obvious pink-gray undertones. It settles a little bit after about an hour but my face obviously looks lighter than the rest of my body, in a really unflattering way. Impressively though, the coverage is medium to full. The most problematic thing about this product is that it just sits on top of my skin and never really sets. As a result, it easily moves around and transfers, leaving spots that reveal my actual skin tone underneath. It also feels heavy on my skin. Also from the Cathy Doll brand, I decided to try their CC cream offering since it’s a more familiar concept than AA. #1 Light Beige was the only skin tone shade available in the store I went to; the other shade was Green, which might be useful for those with skin redness. Light Beige has yellow undertones, and though it looks too pale when freshly applied, it sheers out after blending as it offers barely any coverage. Even so, the CC cream gave my skin a brightened appearance, which I really liked! I also love how this controlled my oil production and reduced the appearance of my pores, making me look like I had a filter on. I only start oiling up after 4 hours of wear, but not as much as I normally do. Unlike the AA cream, this adheres well on my skin, making it feel almost like skincare. As much as I loved this base’s performance, it sadly caused me to break out. I developed some pimples on my cheek, and then on my forehead the day after. Sorry, had to cut this love affair short. 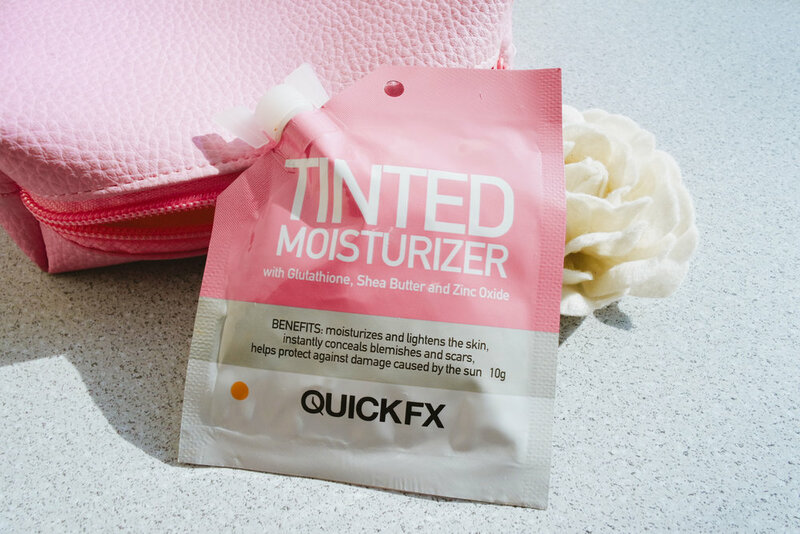 The QuickFX Tinted Moisturizer has developed quite a cult following in local beauty groups. I get it - the formula feels light but adequately moisturizing. The cream looks like it has a lot of pigment but it spreads thinly on the skin, providing zero coverage. It barely transfers though, which is great for our humid weather. Some users claim that this helps to control oil but that wasn’t true in my experience. Among the sachet bases I tried for this story, I liked the packaging for this and the QuickFX CC Cream since both feature a nifty spout that makes it possible to tote the product around even after opening. I also only needed a couple of kidney bean-sized drops to cover my whole face, so a sachet can probably last for a whole month of daily use. Super sulit! My problem is that I also broke out after using this, so remember YMMV! 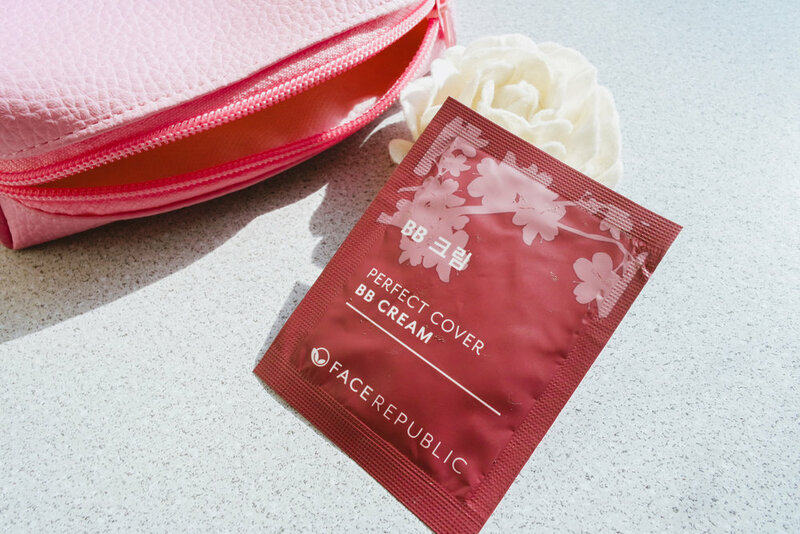 The cream initially looks white and watery when you squeeze it out of the package but don’t worry - it has tiny color capsules that burst when you start blending, changing the color of the cream to be more skin-like. It feels lightly moisturizing, has a skin brightening effect, and offers a bit of coverage. It also smoothens the appearance of my pores and lessens the redness of my skin! You can’t layer it on though as it has the tendency to just sit on top of skin. It gave me a fresh and glowy complexion that my mom even complimented, but it never quite set. I think a sachet can last for more than a month since you don’t need much for one application, so the cap is really handy for resealing it. But make sure to close it as tightly as possible because the cap managed to twist open while I was traveling and the product got all over my things. I wanted to try this because Liz was quite impressed with its performance. 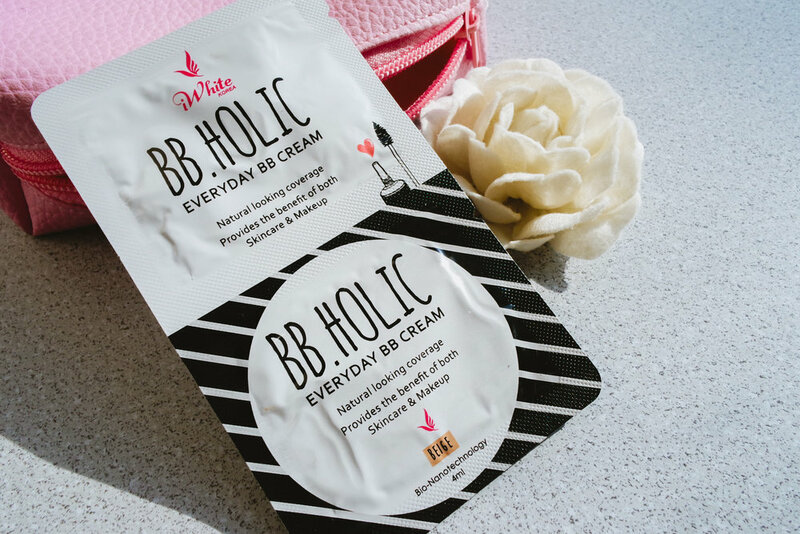 This BB cream comes in two shades, light and beige. I got darker during my stay in the province so I decided to get the darker Beige shade, but it was much darker than I expected! Though it wasn’t a perfect shade match for me, those with more kayumanggi skin tones might appreciate it. There is a strong pink-orange undertone though, which is why it looks really weird on my skin. The light to medium coverage helped to cover some of my PIH and blur my pores a bit. It has a nice dewy finish, but it fades so easily because even the lightest touch to my face erases the product. I found myself using more of this product compared to other sachet face bases, so I think it will only last about two to three uses. It’s just as well as once opened, the remaining product quickly oxidizes. Transferring the cream into an air-tight container might help, or maybe stick to using the lighter shade. Gett tried the in-tube version of this and found it too light for her skin tone, so I thought it might be an okay match for me. The cream does look out quite pale but with yellow undertones, and applies smoothly with enough coverage to conceal my redness. A single layer of application feels perfect, but I decided to try adding another layer for better coverage. This turned out to be a bad idea as the second layer messed up the first one, resulting in both a patchy and cakey appearance. The formula does not oxidize, so it can really only be used by fairer skin tones. The sachet lasted me 2 full uses, with a little bit left that might be enough for one light layer. As Gett also observed, the product transfers easily and my face was completely hulas after commuting and sweating for 2 hours. Best to use this only if you’re staying indoors in a cool area. If I had to pick a product to repurchase, it would definitely be the QuickFX CC Cream. It’s great for brightening my complexion and didn’t break me out, plus it has a twisty cap so I can store it easily. If your skin is not as sensitive as mine, the Cathy Doll CC Cream is also a good choice! Whatever base you choose, make sure to set with powder as these all have a dewy and sometimes almost oily finish. Setting with powder will also help with longevity, and hopefully decrease transfer. Some real talk though: if you can afford to purchase a bottle of foundation or face base instead, it’s the more economical and eco-friendly option. Sachet packaging contributes to a lot of waste and there are no recycling strategies available for these as yet. Have you tried using sachet makeup? What products worked for you? Budget Beauty: What do Cebu beauty bloggers hoard at the drugstore?